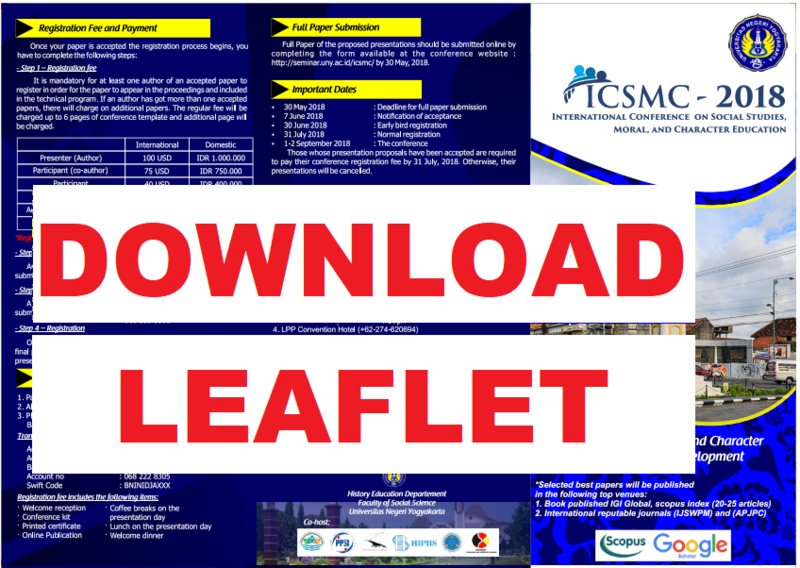 "ICSMC 2018 was held in conjunction with ICoSSCE 2018"
To all of ICSMC 2018's participants please download the conference guide on the page http://seminar.uny.ac.id/icsmc/sites/seminar.uny.ac.id.icsmc/files/Guidebook%20ICSMC%202018.pdf and the schedule on the page http://seminar.uny.ac.id/icsmc/content/conference-program. Thank you. The United Nations initiatives of the Sustainable Development Goals aims to transform the world through a broad range of social-economic development issues, from poverty, inequalities, health, education, climate change, environment, energy, and social justice. The 2030 SDGs agenda have been closely linked to the long-term project of the United Nations Educational, Scientific and Cultural Organization (UNESCO), namely Education for Sustainable Development. For that purposes, all levels of educational programs from primary school to university should provide education which will develop social capital conducive to the establishment of modern state. In line with this we try to synergize tradition and modernity. Up to now we have not made it successfully as we have been independent more than 72 years, but we have not become a modern state. Indeed, Indonesia already has Pancasila as a gentleman agreement amongst various social political groups, but they have difficulty to develop positive dialogues as well as cooperation amongst them. In this regard we hope that social sciences and education of social sciences have contribution to deal with the issues of sustainable development to relate to the issues of morality and character education. To achieve the goals and targets of 2030 SDGs, this conference invites scholars of social sciences and of education around the world to share their research related to the issues of sustainable development as well as morality and character education. As you know modernity have provided us with some opportunities for development, but also have caused some problems related to the development. Accordingly, we are not able to solve the problems just by means of rationality of the advancement of modern sciences. In line with this the roles of national ideology as well as of local culture is very important as catalyst for Indonesian people in the course of modernity. Some educational issues may deal with the issues of the qualities of primary, secondary and tertiary education, as well as equal accesses to education either for boys or girls of urban and rural areas, including those with disabilities, also indigenous peoples and children in vulnerable situations. We may participate to ensure that all learners acquire the required knowledge and skills related to sustainable development. The proceedings of the 1st International Conference on Social Studies, Moral, and Character (ICSMC) will be published in proceedings by international publisher and indexed by Google Scholar. Furthermore the proceedings will be sent to Scopus and ISI Thompson for indexing.